Widespread But Status Unknown. The great crested newt is one of the fastest declining amphibian species in the UK. Over the last 60 years important habitats have been lost to agriculture intensification. 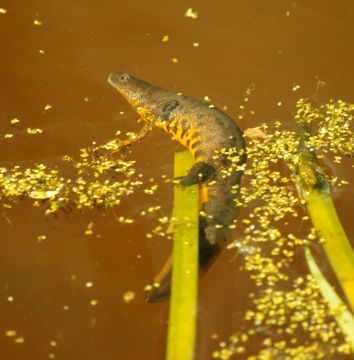 Pond loss is a major factor in the decline of the species. Development of derelict land has pushed the species into the forefront of 'protected wildlife' issues in planning. The perceived status of the newt is much more commoner than the situation on the ground. 7,000 to 14,000 ponds are found in the county with only 611 crested newt records from around 250 crested newt sites the status of the species cannot be determined. The species was considered widespread in 2001. The situation is the same in 2009 though more detailed records are known in areas such as Harlow where there are widespread colonies but all of them are small in size. In Southend the species is known only from around 6 sites and only one colony is based around a cluster of ponds on the edge of the urban fringe. Reasonable records are found in the South East, South and Central areas of Essex. Further records are being put into the county database in Uttlesford following the publication of the Evironmental Statement of the Expansion of Stansted. Breeding pond losses have occurred in the county - a newt pond was infilled in Chrishall - a known newt area. A further reduction in breeding habitat occurred at Abbotts Hall Farm as a result of the coastal realignment project. Terrestrial habitat was removed, by digger, literally metres away from a known breeding pond at the Backwarden Reserve, Danbury. Significant development projects threaten several metapopulations of newts including Sadlers Farm A130/A13, North East Chelmsford Bypass, and Stansted expansion. Vulnerable in many places. A major development in Thurrock has resulted in 24 new ponds being created on the south Essex marshes.